The patented HairLift™ system lifts, loosens and gently removes hair from the root - even short or flat-lying hairs. In fact, the Silk-épil Xpressive removes up to 7x times more short hairs (0.5mm) than waxing. Skin stays beautifully smooth and stubble-free for up to 4 weeks. No need to wait for hair to grow long enough for waxing, you can be smooth anytime. Silk-épil Xpressive features a flexible head that can pivot by up to 15 degrees forward and back. This means it can better adapt to the contours of the body for closer, smoother, more comfortable and efficient epilation. For further comfort, massaging rollers assist the hair removal process. 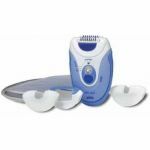 They offer skin stimulation so skin is better primed for epilation and helping to reduce any discomfort. The cordless models give you the freedom to epilate in comfort wherever and whenever desired. 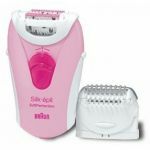 With a 40-minute running time when fully charged – easily enough for a full epilation – they run for longer than most epilators on the market today. All Silk-épil Xpressive models have a sealed body, which means they can be fully washed and ready for the next use.